I have just re-read our original commentary, "Some Thoughts About Mushroom Poisoning" (which follows), in light of a recent event that touched us personally, and deeply. On reflection, I feel our earlier article explained these things properly, but the cautions may need even more emphasis. Eating wild mushrooms is serious business, and needs to be approached that way. Here's what happened. A couple who lives nearby called me about some mushrooms they'd found growing by the side of a nearby, rarely-traveled road. They thought they were "the Prince," one of the most desirable and highly prized edibles of all mushrooms. They'd never encountered Agaricus augustus before, and wanted my help in identifying them. I dropped by their home later that day to have a look. When I first saw them, I was sure in my own mind that these were, in fact, Agaricus augustus, but being sure in my own mind isn't enough when identifying mushrooms you intend to eat yourself, much less for others to eat. I'd come armed with three of our most trusted books: The New Savory Wild Mushroom (McKinneyStuntz/Ammirati), the recently published Mushrooms of the Pacific Northwest (Trudell/Ammirati), and Mushrooms Demystified (Arora), and proceeded to go through the descriptions of A. augustus in each of them, pointing out how these specimens conformed to them. I then used the "keys" in Mushrooms Demystified with the couple to verify and double-check ourselves. All this may seem like overkill, but stay with me, here. First, I wanted to make sure we weren't cutting any corners. Gilled mushrooms are inherently trickier than most of the common non-gilled mushrooms we gather, like Chanterelles, Hedgehogs and Boletes, and the consequences of a mistake can be dire, indeed. 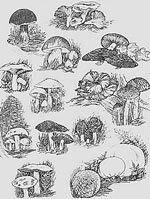 Second, I saw it as an educational opportunity - for them and for me; sure, I was pretty familiar with this mushroom, but every time we open a book, we can't help learning something, and I wanted them to understand that this is serious business, one that requires certainty before even thinking about eating any wild mushroom. Our book work done, I confirmed that I was confident that these specimens were Agaricus augustus, considered to be a very fine edible (indeed the cover of Mushrooms Demystified confirms this). I stated that I, myself, had eaten these mushrooms in the past and found them to be delicious; I would happily eat these, had I found them, after going through the identification process we had used. But we still weren't done. I explained that even mushrooms thought to be edible and choice can cause adverse reactions in some people for reasons not clearly understood, and I cautioned them to eat only a small portion (thoroughly cooked, of course) the first night to make certain they weren't among them. I re-verified that these had been gathered in an area by the side of a road that I knew had very little traffic and was never sprayed with herbicides. I also told them a story about the esteemed Dr. Denis Benjamin, author of the best book on the subject we know of, Mushrooms: Poisons and Panaceas, who once accidentally poisoned himself with a variety of mushroom he'd gathered and eaten frequently before, and was certain his identification was proper. He discovered the next day that the area where he'd gathered them had been sprayed liberally with weed killer just hours before he'd arrived; the mushrooms hadn't poisoned him, the weed killer had. This wasn't to scare them, but to caution and educate them. At the time, I thought that what I was doing was not only educating them, but helping them to form good habits that would help them to safely gather and eat wild mushrooms in the coming years. I wished them a wonderful meal, and left them to prepare their dinner. The following evening, they called me back. Rather than telling me how good the mushrooms were and how much they'd enjoyed them, the lady proceeded to tell me that they had both become very seriously ill shortly after eating the mushrooms. They'd cut up only one stem, and had cooked it thoroughly in butter, fresh garlic, a little white wine and a pinch of salt. She reported that they were absolutely delicious, but not long after the meal, they became very nauseous, eventually vomiting, developed both diarrhea and excess gas, and their blood pressure had increased dramatically. Now, 24 hours later, they felt better, and the vomiting and diarrhea had subsided, but they felt nauseous and weak and, in general, just plain lousy. I was flabbergasted, and deeply concerned. Of all the calls I expected to get, this was the last. After questioning her further, I called several of the most knowledgeable mycologists we know to seek their advice. The consensus was about what I expected (which was comforting in itself); that with many wild mushrooms, some people experience bad reactions to them, while most other folks eat them with no ill effects. That both of these people had had such severe reactions despite the fact that they were not related by blood seemed an odd coincidence, but not unheard of. One expert I talked to said that he himself had the exact same reaction to Agaricus augustus. Everyone concurred that the reaction (while alarming) was not permanent, and would diminish over the next few days. A small comfort, perhaps, but an important one. As I write this, their symptoms have continued to diminish, but they are far from feeling their best. Their bodies are telling them that they don't like what they were fed, and want no more of it. Message received and clearly understood by all, I am sure. What have we learned? One thing is the wisdom of eating a small amount first, to determine whether you have an individual but adverse reaction to a mushroom considered to be eminently edible. Another is the importance of being aware of where a mushroom is growing, and how non-related toxins may be present from spray or road run-off, even though that doesn't appear to have been a factor here. A third is the importance of caution in identifying with absolute certainty any mushroom you intend to eat. And finally, even if you do all these things (as this unfortunate couple did), you can still have an adverse, possibly extreme, reaction to eating wild mushrooms, even when you do everything right.